Hi there, hope you all had a beautiful Easter weekend! 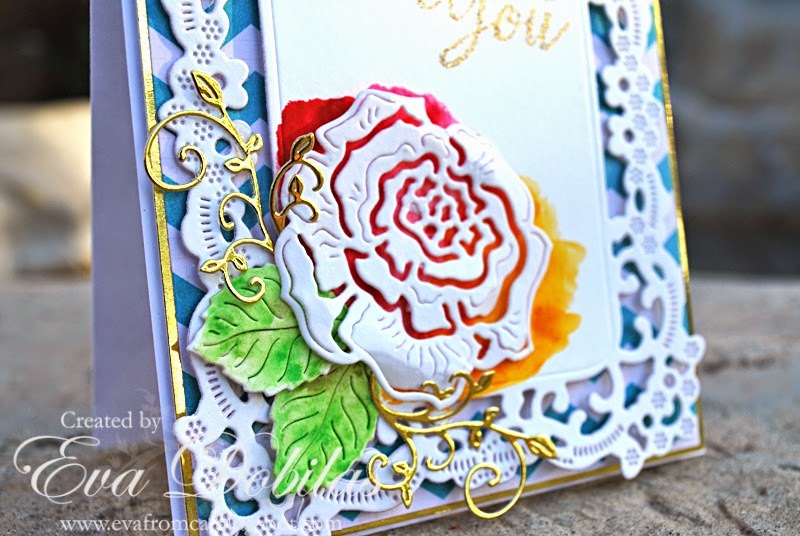 I have a pretty card to share with you using Cheery Lynn Designs dies and JustRite Papercraft stamps. I started my card out using the Fiona's Magic Mirror die, which I die cut a water color paper with since I had intentions of water coloring it. I die cut the Rose and Leaves die once again with water color paper, and left the rose white, but painted the leaves with green colors. I water colored the area where my rose was going to be in with pink/orange colors, so it can show through the die. I added Tiny Fanciful Flourish Right and left, which I die cut using gold foil card stock and added it to my flower. I added a sentiment from the Grand Handwritten Sentiments stamps which I gold embossed on my card. Thanks for stopping by today and good luck to everyone entering our Weekly Challenge with the chance of winning a $20 spending spree at Cheery Lynn Designs.